A relaxing and stylish addition to your living room or den, add this casual style Sleeper Sofa into your home. 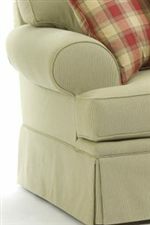 The perfect place to relax after a long day, read a book or watch television in the comforting softness of this piece. 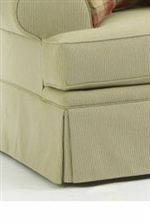 Featuring DuraCoil cushions and a sinuous spring design for maximum support, you'll love the durable design of this piece for years to come. Softly rolled arms and a sophisticated skirt covered base add a tailored look you'll love. In the evening time, easily pull out the queen sized Air Dream mattress for overnight guests to catch a solid night's sleep. The Emily Queen Air Dream Sleeper Sofa by Broyhill Furniture at AHFA in the area. Product availability may vary. Contact us for the most current availability on this product. Tailoring Hand tailored for smooth corners and straight seams. Arm Rolled Arm with welt cord trim. Leg or Skirt Skirt covering the base adds to the casual style of the collection. Browse other items in the Emily collection from AHFA in the area.